Open up this week's Ad Age (and no doubt every major trade pub) and you'll find wall to wall Infinity Broadcasting advertising - I counted 22 pages of roadblock advertising. 22 pages of "we're new" and "we're cool" and "there is life after Howard Stern" and "we're free, which is better than paid" and "a magician, washed up singer, perverted talk show host" et al means we're new, we've changed, we're better and we're going to win. Your inferiority complex is so acute, you've had to litter an entire publication to convince yourselves (because you're not convincing us) that things are going to be ok. When the walls are crumbling and threatening to tumble down, you call in a new painter...instead of levelling the whole damn antiquated format and starting from scratch. This is just like GAP...celebrity doesn't work, call in a new one. Or in the case of Howard Stern's defection, change the lineup instead of changing yourselves. Start by reducing your 8-10 minute pods of irrelevent, untargeted and 100% pure drivel and work your way from there. Where in this plethora of messaging was any sign that Infinity has changed for the better? The one call to a website or the invitation to join CEO, Joel Hollander on November 2nd, 12 noon EST for a webcast? 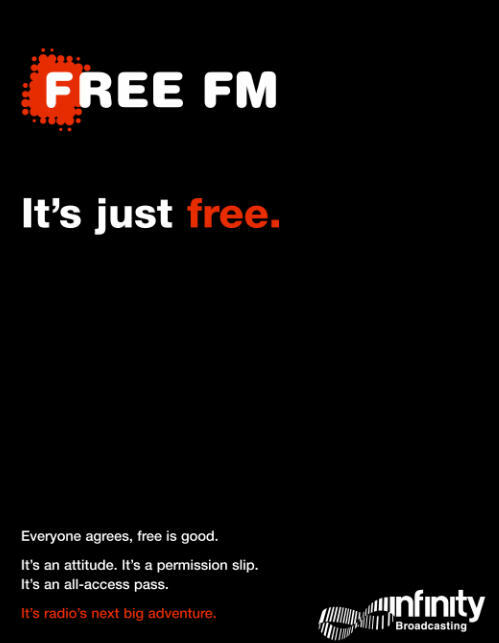 GIVE ME A BREAK - appointment viewing is so yesterday...and while we're at it, if you're trying to swing for the fences with FREE FM, you've lost that one as well...it's called PODCASTING and it's way ahead of where you'll ever be. PS The whole bit about the censorship doesn't work either. You might think laughing at yourself is cool, but nobody else does, when you look like a bigger fool doing it. PPS The Infinity website is a disgrace. The integration with the trade campaign is negligible. There is no clear link to the webcast invitation. The podcasting offering is a token olive branch at best. A nonlinear conversation this week. * Andrew Denny's feedback - which arrived on of all things, paper! Way to go Andrew! Significant Mentions: Jason Calacanis, Andy Cooper, Merlin Mann's weekly review podcast, Martha Stewart's book, Seth Godin, Scott Donaton's comments, Howard Stern, Sirius, Steve Gillmor, Podshow, CNBC, Hacking Netflix, Jackie Huba/Ben McConnell, Jeff Jarvis, George Masters, Jaffe's Nike Ad, Steve Hall, Tom Hespos' post, Tracking Trader Joes, JetBlue, Vespa blogs. The only viable conspiracy story here is the Mainstream Media's attack on an idea whose time has come. The attack on the blogosphere is an attack on consumers. It is a stunning example of the desperation of the old guard that is feeling so persecuted and paranoid, that they're now abusing their mouthpiece and platform to resort to childish and immature statements like, you're ugly and your mother dresses you funny. This at a time of unprecendeted magazine circulation scandals and acknowledgement from the very top of the media food chain - from Murdoch to Sorrell - that times, they are a changin'. Reuters article cites some pithy comments from WPP's Chief of Chiefs, Sir Martin Sorrell, on the rise of the Web and the demise of so-called traditional. "There are major changes and we don't understand the speed and scale at which they're taking place." "I think there's a certain amount of panic among media owners. Most of these companies, ours included I suppose, are run by 50- or 60-year-olds who have trouble getting it, and who really don't want to see change on their watch." While I appreciate the sentiment (and to my knowledge, this is a pretty damning indictment from someone so high on the totem pole), I'm a little concerned as to what this says about WPP (or any of their competitors, counterparts, clients or partners for that matter) If there is any bit of truth to this - and I think we all know there is - what does this say about the process? 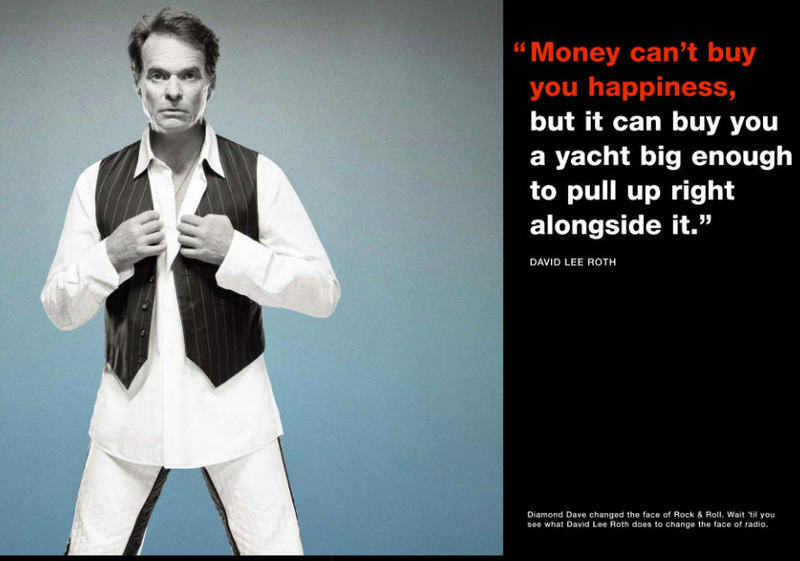 Are clients/shareholder best interests taking a back seat to job security and ego? More specifically, what exactly should the companies Sorrell cites do about it? It's not good enough to acknowledge it; if these "media owners" and the like refuse to change...they need to be changed. Period. "Rupert Murdoch, who I admire more than any other media executive ... has been willing to make (Internet) acquisitions almost willy-nilly"
Points for anyone in a reasonably senior position who can use the phrase willy-nilly in a sentance. 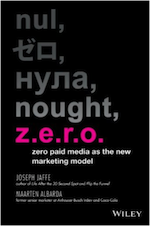 But seriously, it's a little strange for a holding company to remark on a media company when it comes to acquisitions. Obviously there are concerns about valuations and validity, as well as deja vu all over again ala dot bombfest. In the interim, Sir Martin...give the book I sent you a read and if you didn't get it or your Exec Assistant tossed it in fear of you having a panic attack, drop me a note and I'll send you another. 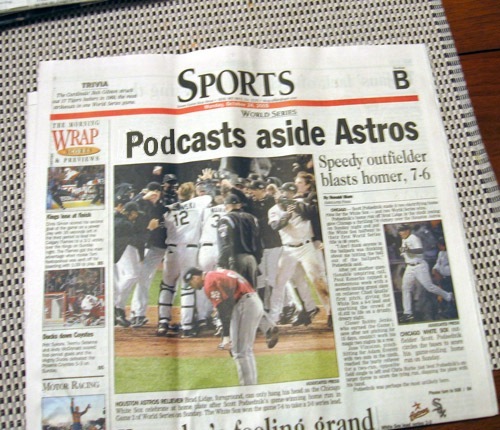 My ATS co-host, Steve Rubel, found a newspaper headline titled, "Pod casts aside Astros," which referenced Scott Podsednik's game-winning home run in Game 2 of the World Series. His post was titled, "Astros succumb to podcasters"
I doctored the headline to read, "podcasts aside Astros" to indicate that podcasts were a part of the whole consumption experience: case in point, this morning...my MLB Podcast was ready and waiting for me, with highlights/interviews from the winning players. Although podcasting (Radio TiVo) is completely time-agnostic and on-demand, I was very impressed that the podcasters behind MLB's daily show had capitalized on this moment and had recorded a special show which was special, relevant and a bonus to me and my morning commute into the city. Have you played the new game that's taking the nation by storm? It's called Ad Invaders (also known as 30-second spot Invaders) and is modelled on the classic arcade game, Space Invaders. It's so cool. All you need are the thumbs up and down buttons on your TiVo remote. Why fast forward or skip ads, when you can obliterate them from existence and prevent them from ever coming back to torment you. It's awesome. No more insulting creative, hyperbole or exaggeration. No more corny jokes. Banish bad ads forever and see if you can set a record or outscore your neighbor. And coming soon...branded entertainment invaders, where you can do the same to ads hiding in content...but be warned, some of those placements are pretty sneaky indeed. PS Current record is held by Jonathan Adelstein who goes by the handle, FCC. This is obviously not real...but it could be one day. Here's another look at a similar scenario. Hart + Larsson - say it 1,000 times over; commit it to memory and then file it away under "agencies to NEVER do business with. EVER"
I invite you to go to their website where they have posted a recruitment ad where "only Neil French need apply"...let their counter ring off the charts. 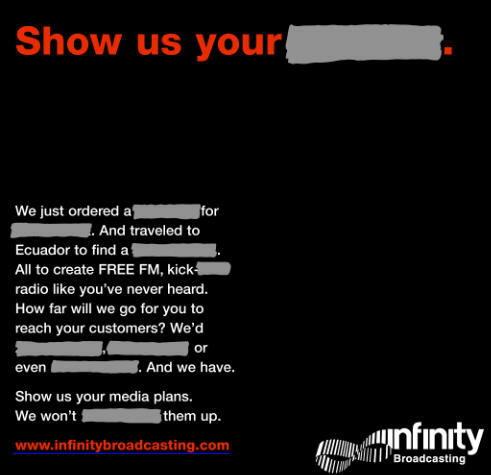 Demonstrate to them the power of viral marketing - except this time, working against them. Send them an e-mail to womendocrap@hartlarsson.com and tell them what a bunch of morons they are. How absolutely ironic that this post immediately follows the tribute to Rosa Parks. Here's a cool idea I came up with today, following a question about the importance of consumer reviews. Many movie studios struggle to break away from the tried and tested/traditional media outlets. For example the full page or spread in the newspaper. In some cases, its a contractual committment and in others, it's a political hotbed. So along the lines of using traditional mediums in surprising and unexpected/non-traditional ways, how about populating an upcoming page/spread with consumer reviews - real reviews from real people - who would be identified as such. Perhaps tie-in with moviefone to assign the overal communal rating as well. In my presentation, I spoke about needing a Net Present Value for ROI (in other words the means to evaluate and quantify the long term effects of branding) and then it struck me....we can learn a lesson from blogs, can we not. What we need is a "branding trackback" mechanism. It's so easy to implement and it would be really valuable to get a deeper understanding and insight into "deferred conversion" or whatever you'd like to call it.